If you follow me on Instagram and watch my stories, you have seen and heard me talk about these magnetic lashes. I was really curious about magnetic lashes for a long time but I wasn't willing to spend $60 on a pair when I didn't know if I would like them. Then I found out Ardell finally came out with their own version. These were only $13 at Ulta. There's definitely a bit of a learning curve putting them on but once you find your groove they're a great alternative to glue on lashes. I've tested wearing them for up to 10 hours with no issues. I did trim my pair a little bit both so they were shorter and at an angle so they blended in with my natural lashes more. Otherwise, they did look a little aggressive on me, but if you naturally have fuller lashes they may blend fine. I linked the exact pair I'm wearing but there are other variations as well. 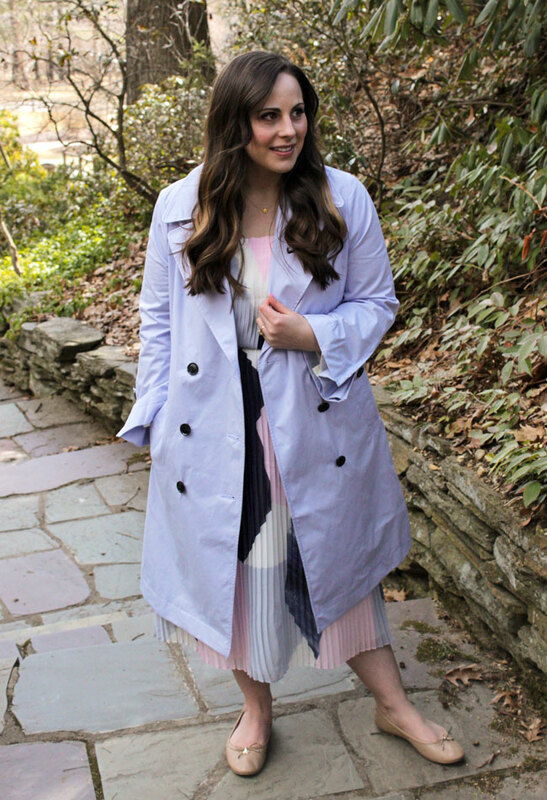 Also, just so you know, the coat and the dress in this post are both on sale right now! They're both true to size and I'm wearing a 4 in the dress just for reference. It also comes in petite sizes and another color combination. I'm wearing a medium in the coat because I always size up for outerwear in case I have layers or a sweater on underneath so I don't feel like a sausage but a small definitely would have fit. This would make a great look for Easter. Such a stunning spring look! I love the pastels! 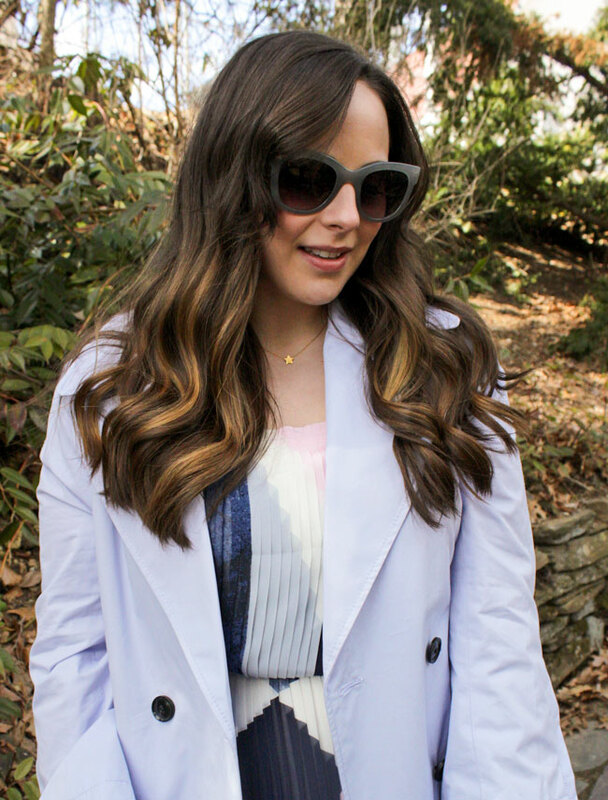 Love the color of this trench, it's so feminine and perfect for Spring! I also LOVE that dress! I really need that trench coat! Such a pretty color! Just love this light blue jacket, so perfect for this time of year. That dress is gorgeous with it and I just love your makeup and little star necklace here! Thank you so much Carrie! You're so kind! Love that look! The coat pairs perfectly with that dress! I did not know magnetic lashes were a thing or even existed! I will look for them the next time I am in Ulta. Cute outfit! You're pastel from head to toe! 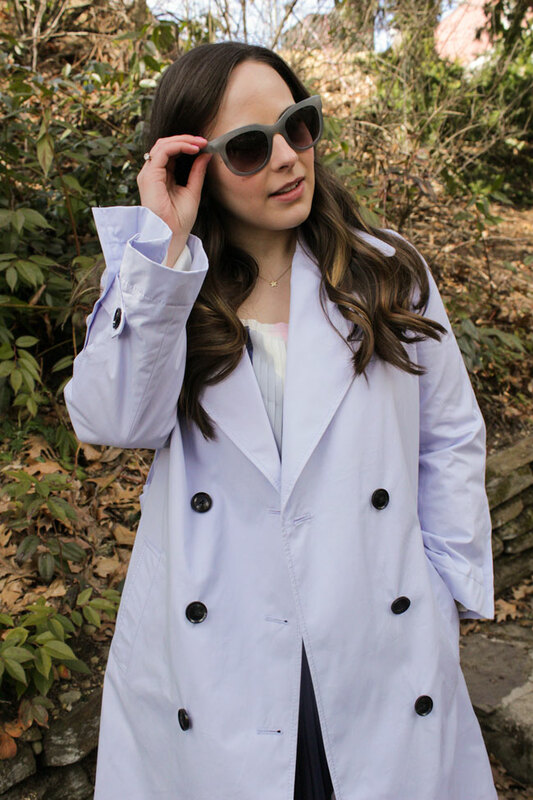 What a gorgeous trench coat! Lavender suits you very well!